Each piece dispenses salt at one end and pepper at the other. On four ball feet. 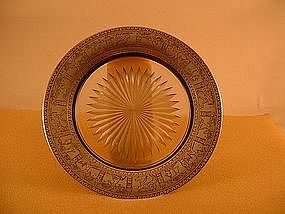 "SALT" and "PEPPER" engraved at the ends on the top of each piece. Lids removable to add salt and pepper. Length 1-7/8". Width 7/8". Height 1-1/2". 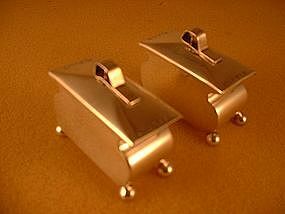 Weight of the pair is 2 troy ounces. 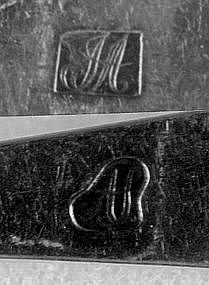 Both pieces are marked incuse STERLING MHJ. Mark and overall condition are excellent (small dents in some of the ball feet). 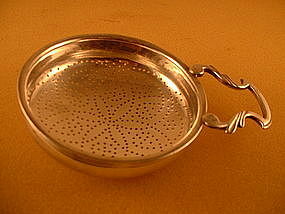 Pull-off pierced lid with finial. Applied molded ring base. Height 6-3/4". Diameter of base 2-13/16"; of body 2". Weight 6-1/2 troy ounces. 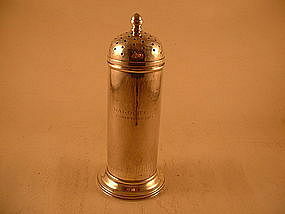 The monogram on the side is HALDOTE - PA/CHRISTMAS 1913 (Haldote a first name?). Mark and overall condition are excellent (small base dent, some fire scale). The holes in the piercing form a floral design. The maker appears to be ST (not sure of the T). Length 5-1/4". 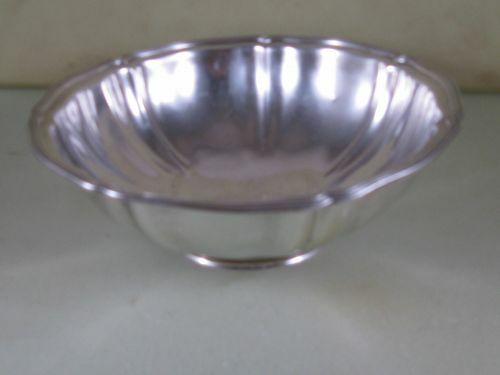 Bowl diameter 3-13/16". Weight 2.9 troy ounces. No monogram. Overall condition is excellent. Mark condition is also excellent except that the maker's mark is somewhat rubbed. 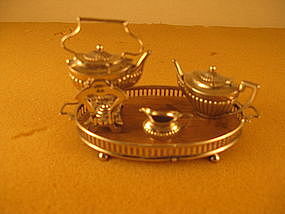 Four pieces: tray (wood bottom),kettle-on-stand, teapot, creamer. All except the creamer are by L&S;Birmingham, England; 1905. The creamer is by AM&Co, Birmingham, 1956. 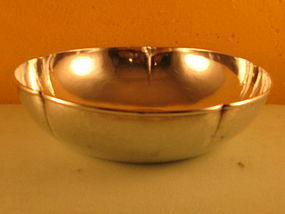 Bowl, square with rounded corners, by Towle, 20th C.
On molded base. Length and width 9-1/8". Height 5-1/4". Weight 21.6 ytoy ounces. Monogram on side, script MLG. Overall and mark condition are excellent. 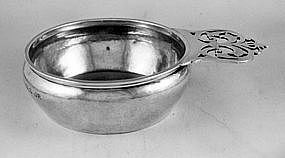 Child's cup by Tucker;San Francisco,CA; ca. 3rd Q.19C. Marked I.W.TUCKER/SANFRANCISCO.CAL, name and location each in a rectangle. 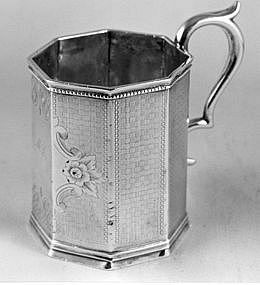 Octagonal, double-scroll handle, engine-turned design with large reserve on the front. Applied molded rim top and base. 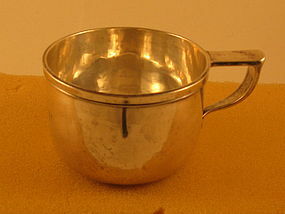 Height of handle 3-13/16"; of body 3-1/4". Diameter of mouth 2-5/8"; of base 2-7/8". Weight 4-1/4 troy ounces. 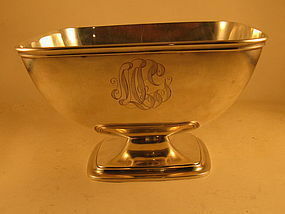 There is a script monogram M.C. on the front in a reserve. Mark condition is good; overall condition is also good (many minor dents in body). 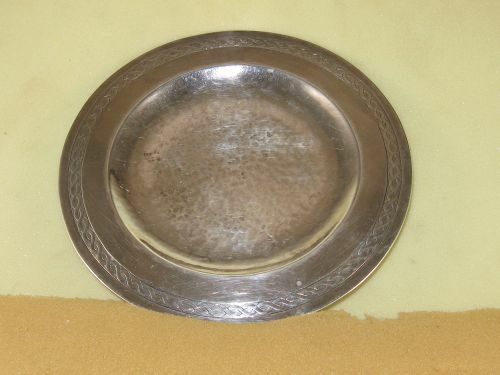 Hammered finish. Length of each piece is 9-1/2to 9-3/4". Total weight 9-1/8 troy oz. The monogram is an applied L on the top of the handles. 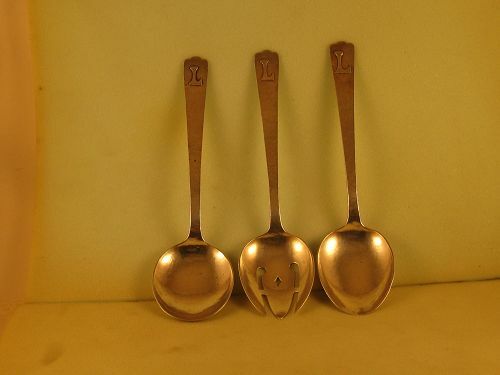 Overall and mark condition are excellent (one spoon is not marked sterling [not struck evenly]). Marked STERLING/HANDWROUGHT/ AT/THE KALO SHOP/18. Five lobes. Diameter 7-1/4". Height 2". Weight 8.4 troy ounces. No monogram. Overall and mark condition are excellent. Downturned, pointed handles, V drop. Length 6-1/4". The monogram is a script MR. 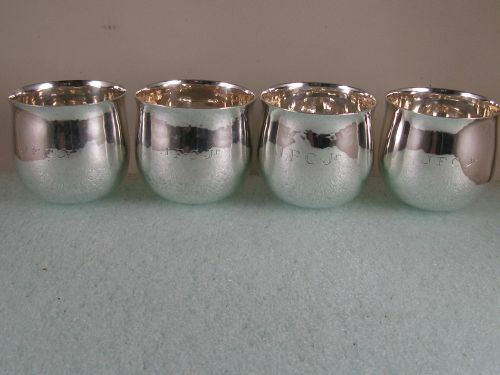 This is actually a set of 6 spoons, 3 marked by J. Adam and 3 by AS (Alexander Simpson, see Hollan,VA&WVsilversmiths). 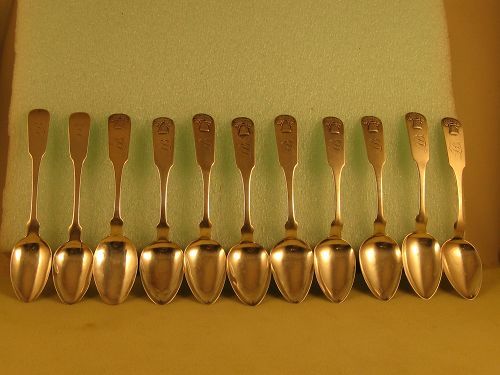 The 6 spoons all match, including monogram. The marks on the Adam spoons range from excellent to good. Marks on the AS spoons are excellent. See separate entry for the AS spoons. Overall condition of all 6 spoons is excellent. Bright cut. Marked 3 times at tip of handle SP in a rectangle. 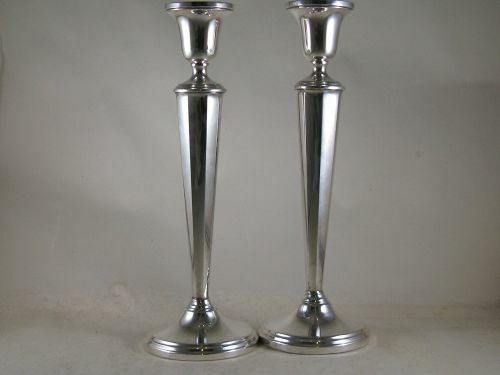 Downturned handles with pointed ends. Oval drops. Circa 1800. (Pitman died in 1804). Length 9". Weight 1.825 troy ounces each. The monogram is a script AS. Overall and mark condition are excellent.